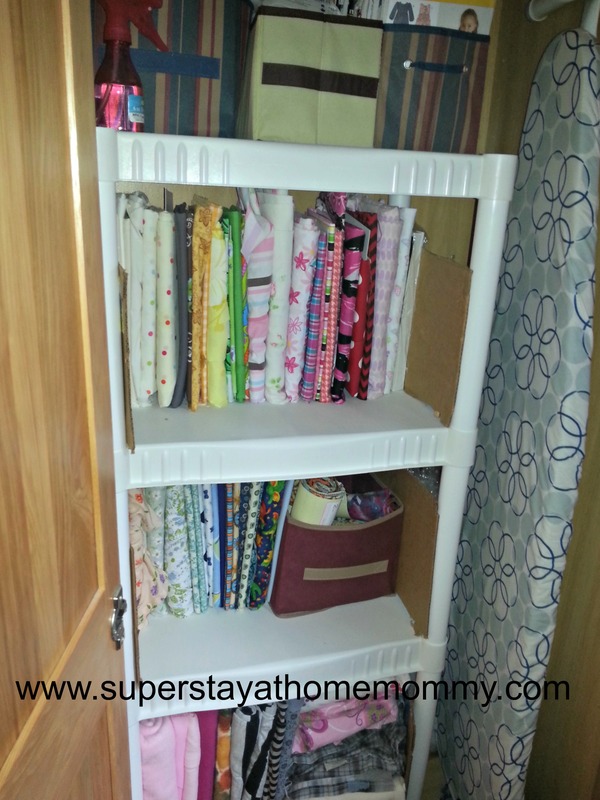 Sewing Room Organization | Super Stay At Home Mommy! Hello!! It’s been a while! Life with a (colicky) baby and a 2 year old can sure get hectic. I swear the time flies by faster than I can keep track of. I certainly doesn’t feel like it’s been over 2 months since I last posted, but it has!! Anyways, in my little bit of spare time, I have been focusing on organizing my little sewing area so that I can get back to doing what I love- creating cute kids clothes! 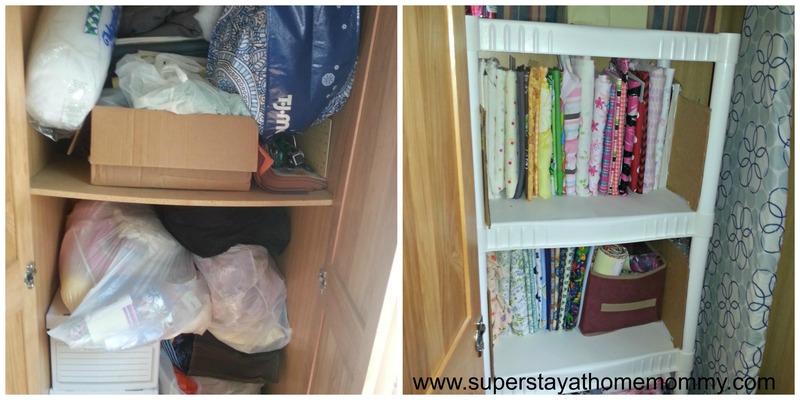 I thought I’d share some of my tips and methods to organizing everything in a small space. YIKES!!! 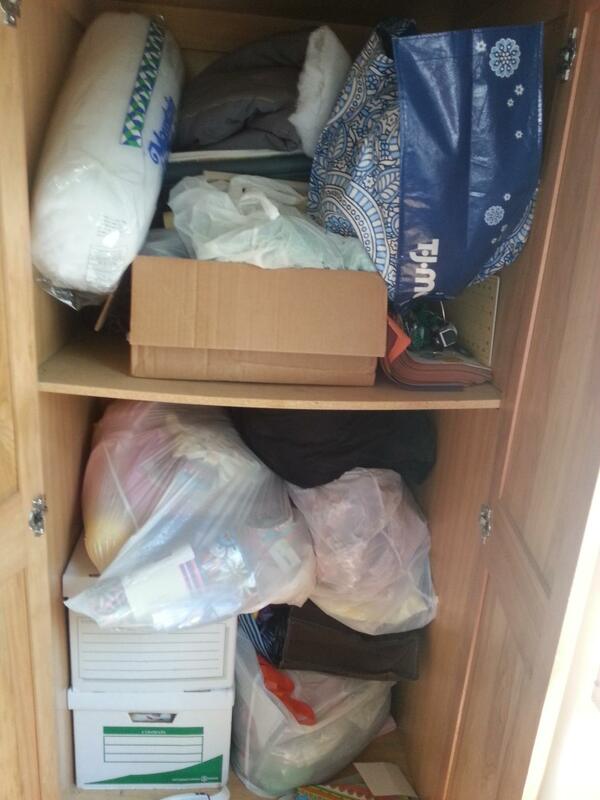 I had to get organized… I just can’t work in a cluttered space. So, first things first, I bought some shelves to place in the cabinet. I decided to use THIS method to fold my fabric to display it in a way that I could see everything that I have to work with. It makes it SO much easier to pick and choose fabrics for each project. The other problem I ran into was how to store my PDF patterns that I’ve printed. This is still a work in progress, but I’ll explain what I’m working on doing. I bought a large binder and a bunch of plastic pocket protectors. I printed the first page (usually has a picture) of each pattern. Place each of these pages in a paper protector, and then slide your pattern piece (folded neatly) in behind them. This way, I can thumb through my patterns and see exactly what I have and have the pieces organized. Because otherwise, they can become quite the mess! I have a couple different methods for storing notions. First, I have one of THESE drawers. 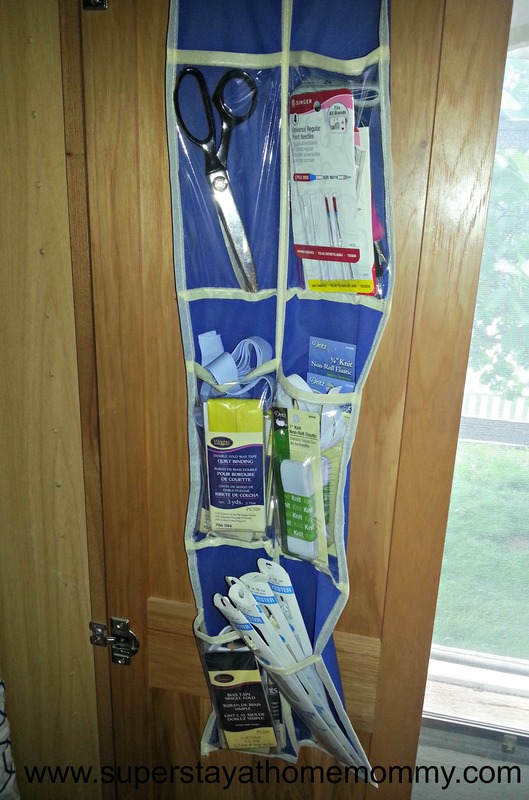 It is perfect for fabric scraps, little containers of buttons, safety pins, etc… I keep all sorts of little odds and ends in there. It’s perfect for my scissors, rotary cutter, needles, zippers, bias tape, elastic, you name it! And all those little packages are organized and out of the way. How handy is that! 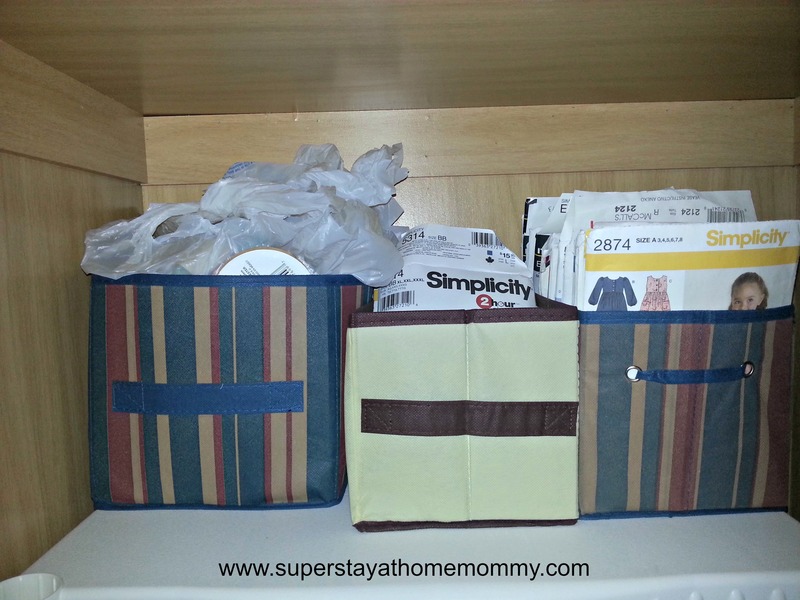 So, there you have it, a few little secrets to organizing a small space. It’s still a work in progress, so PLEASE send me your ideas! I’d love to see more!! And, as always, have fun! Looks like you’re making great progress! 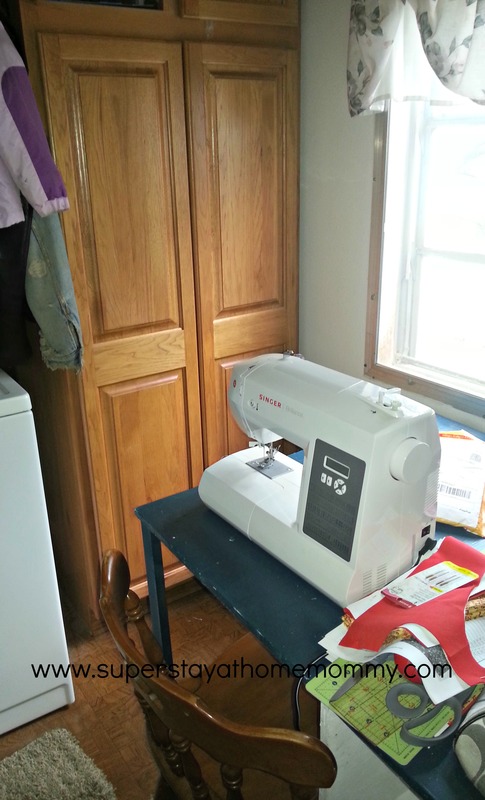 I plan on organizing a couple rooms soon, including my sewing room. I may wait for school to start up again though! I’ve been having a great time too! You’ll have to share some progress pics once you get started on yours!